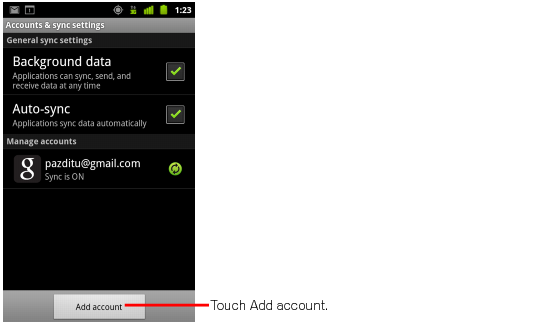 Touch the Settings > Accounts > Add account > Google to add your Google Apps account. Select Existing and enter your full Google Apps email address as your username and your password. After you enter your username and password, a new page appears saying Couldn't sign in. This is likely because you have 2-step verification enabled for your account. Touch Next to sign-in via the browser on your device. Enter your username and password in the window that appears. Enter your 2-step verification code. And going forward, you can change which services can sync with Google Apps on your device at any time by going toSettings > Google > touch your account. If a service you've selected isn't syncing, check with your administrator to make sure that that service has been enabled for your domain. Open the Accounts & sync Settings screen on your device. You can do this in Contacts by pressing Menu and pressing Accounts, or directly in the Settings application. Note: If you've enabled 2-step verification, you may need to enter an application-specific password instead of your password the first time you sign in to your Android device. That's it! You can now use Google Apps from your Android. Just launch Gmail, Google Calendar, or whichever app you want to use, from your device's home or applications screen. If an app isn't already installed on your device, such as Google Drive or Google Keep, search for it on Google Play. Most Android apps by Google can be installed for free. Open the Google Play app on your Android. Search for a Google app you want to install, such as Google Drive or Google Keep, and select it. Follow onscreen instructions to install and download the app. You should then be able to find and launch the app from your applications screen.